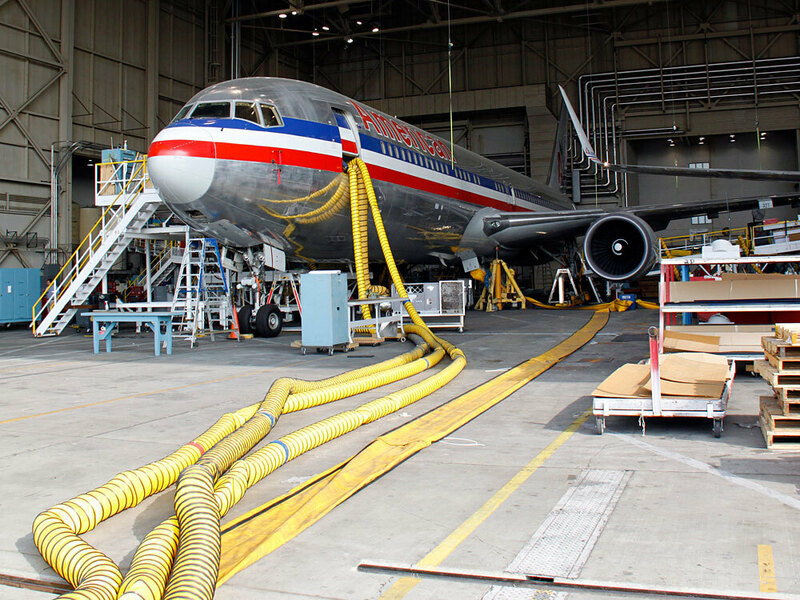 Bucking Trend, Airline Keeps Repairs In-House As many major U.S. airlines shift their repair and maintenance work to outside firms, American Airlines is taking a different approach. The airline has its own crew of 6,000 mechanics based in Tulsa, Okla., who service its fleet and even contract for outside business. An American Airlines jet undergoing maintenance at hangar No. 6 in Tulsa, Okla. American has a crew of 6,000 mechanics at this facility to work on its fleet. The mechanics also service other airlines' planes. As more and more major U.S. airlines shift their repair and maintenance work to outside firms — often in foreign countries — American Airlines is taking a different approach. Instead of outsourcing its airplane maintenance to Mexico and South America, American is sticking with its own crew of 6,000 mechanics based in Tulsa, Okla., to service its fleet. This "insourcing" strategy also allows American to contract with other airlines and freight companies to service their planes. Facing intense competition from foreign maintenance companies, American and its mechanics have collaborated to cut the time and number of workers needed to complete a major overhaul called a "heavy check" — during which mechanics strip the interior of the plane all the way down to the skeleton. The overhaul now takes 12 days instead of 22, and a little more than 300 workers, down from 700. Troy Sokolowski, who oversees the airline's MD-80 major repairs, gives much of the credit to his mechanics. "Why it's such a huge success is because we had people off the floor — who actually do the job — who said this is how we could do it and we can do it more efficiently, and we can do it better," he says. American has agreed not to lay off the mechanics freed up by the efficiencies. Instead, it's bringing in business from other airlines and freight companies. On a recent Friday, two of the three positions on American's MD-80 repair line were occupied by aircraft without American's double A on their tails. But how can this maintenance facility compete? American's mechanics make $32 an hour, plus benefits. Mechanics in Mexico and South America make about a quarter of that. One way American stays competitive is by getting customers' jets back in about half the time. Instead of having their jets sitting in a foreign hangar for a month or six weeks, American can get the plane back to customers in less than two weeks. 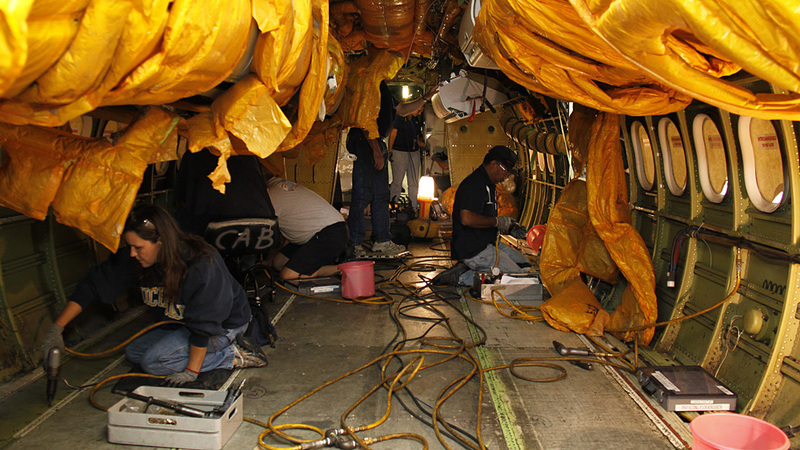 Aviation maintenance technicians Gina Teague (left) and Prasad Itty (right) work on the interior of an MD-80 jet at American Airlines' Tulsa overhaul base. And by repairing existing parts instead of replacing them, American can save its customers thousands of dollars. Senior Vice President Carmine Romano says his mechanics can repair and fabricate almost everything in-house. "We have a landing-gear shop. We have an engine shop. We have component shops. We have airframe overhaul," says Romano. "So we can do everything right here under one roof." Every Friday, maintenance management, the union and the mechanics have a standing meeting on the hangar floor. First, the mechanics get a report card from managers on how they did that week. But the accountability works both ways: The union also gets to take control of the microphone in these meetings to speak directly to management and to communicate with the mechanics. Both American Airlines' executives and the mechanics say these regularly scheduled forums reduce antagonism. While it doesn't look like they're all going out together afterward for Friday happy hour, the atmosphere in these meetings is respectful, even collaborative. "We're going through a culture change," says Steve Luis, president of the Transport Workers Local 514, which represents the 6,000 mechanics in Tulsa. Faced with the brutal possibility of losing their jobs forever as they watched what happened to colleagues at other airlines, the union mechanics have given back billions to the company, Luis says. And they've agreed to be held accountable to strict production goals and cost-cutting efforts. "It's about business savvy, accountability," he says. "Where everybody is going to be accountable for what they do on a day-to-day basis." It hasn't all been smooth sailing. Last spring, the FAA forced the cancellation of hundreds of American, Delta and United flights for missing routine inspection deadlines for wire bundles. And this week, American confirmed that it is under investigation for using fasteners not approved by the FAA in the bulkheads of 11 of its MD-80 aircraft. But the complaint now coming from both American Airlines and the president of the Transport Workers Union is that the FAA needs to give maintenance facilities south of the border the same aggressive inspections they endure in the U.S.
Luis, the union president, says the FAA is looking over American mechanics' shoulders all the time in Tulsa. He wants it to be the same way for their competitors. Maintenance facilities overseas should "have to go through ... the same scrutiny as a maintenance base in the United States," he says. "[That includes] drug testing, alcohol testing and all the compliance that we have to follow." American Airlines' executives say that keeping their maintenance in-house is a smarter and safer strategy. But both the union and American's management say that if other airlines are allowed to escape strict federal oversight of their maintenance operations overseas and pay lower wages, what's left of the domestic repair industry will slowly die.